Eddie Martinez, who mounts a new exhibition of works atTimothy Taylor Gallery this week, is among a select group of emerging New York artists who are taking over London this month—alongside him, Justin Adian opens his first U.K. solo show at Skarstedt in Mayfair, while in the East End Will Boone is featured at Jonathan Viner. In recent years, the 38-year-old artist has made a name for himself through whatNew York Times critic Roberta Smith called “exceptional gifts as a painter and draftsman,” combining cartoonish figures and graffiti-inspired designs on vibrant, impastoed canvases. Last summer, New Yorkers lauded his solo exhibition at Half Gallery and his abstract sculpture at Venus Over Manhattan, but come Frieze Week, he’ll be met with the critics across the pond as his new series debuts at the gallery and Frieze London—at the same time. The exhibition’s title “Island I” refers to the context behind the series’ fruition—Martinez worked in isolation in his Long Island studio—and the Rastafarian concept of “I and I.” Rastas use the phrase “I and I,” rather than “you and me,” as an egalitarian gesture, and also to convey the union between soul and body. Though Martinez once compared his physical, spontaneous process to working in a boxing ring, the paintings in his new series was made using a limited range of motion. Faced with a compression injury, the result of one too many rounds of tennis, the artist followed his planned production schedule, modifying his process to make up for a lack of mobility. The unexpected impairment may have been a blessing in disguise, giving his work a new edge. “Limited movements make fast, confident moves on the canvas,” he explains. Though Martinez has become sought after for his Basquiat-esque figurative paintings with pop-art elements, he recently has transitioned toward making simpler, abstract pieces. The juxtaposition of vivid colors, painterly gestures, and composition in “Island I” are reminiscent of Joan Miró’s work. 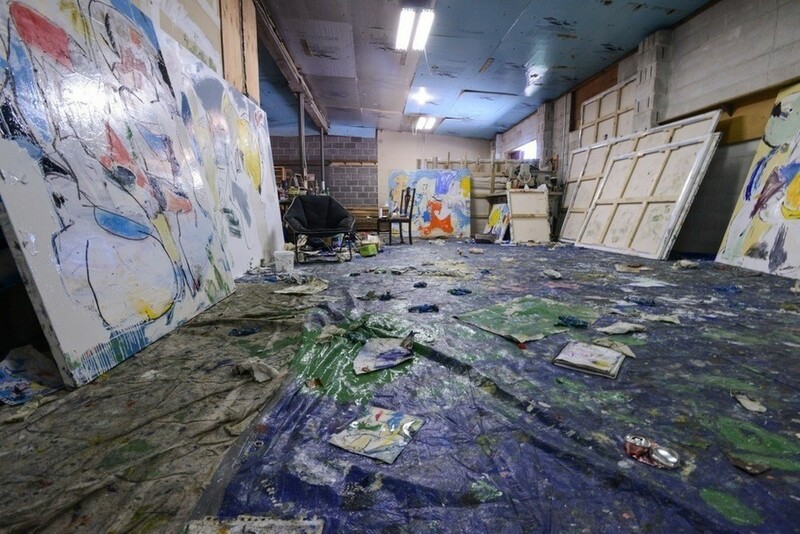 By incorporating mixed-media objects such as gum wrappers, paper towels and baby wipes, Martinez gives the expressionist works a grittier edge, reflecting the urban chaos of the artist’s surroundings.